When I travel, I like to wear a crossbody bag to keep my hands free. However, I swear these bags are made for giants because the strap is just too long–even when I buckle it in the last hole. Instead of hitting me at the hip, the bag is swinging down around my kneecaps somewhere. It is most uncomfortable to walk like that. The solution? 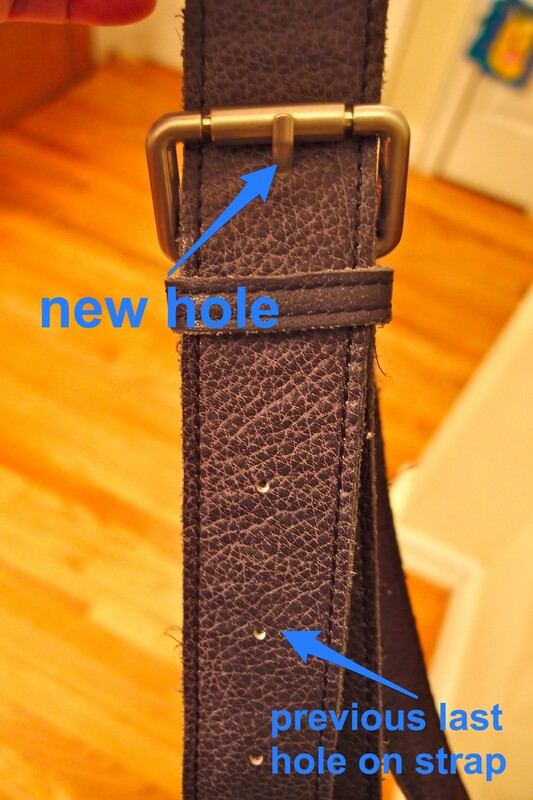 Make a new hole in the strap. This can easily be done by your local cobbler. Since I am a regular customer, my cobbler doesn’t charge me for this service, but most shops will only charge a dollar or two. The task is accomplished in about a minute. It’s a small thing, but it makes such a big difference. This tiny adjustment allowed me to comfortably carry a cross-body bag around Paris. Voilá! I’m linking up with What I Wore Wednesday and Monday Mingle. I’ve had to make new holes in my bags and shoes! I also do that for belts. Good thing I have a trusted cobbler who can do it in a jiffy. I’m a dummy, apparently, because I had no idea that cobbler’s still existed. Great tip, though; I’m a shorty too! I call them “cobblers” because I like that word, but I guess people in this century call them “shoe repair shops”….but aren’t they cobblers if they fix shoes, like repair a broken heel?